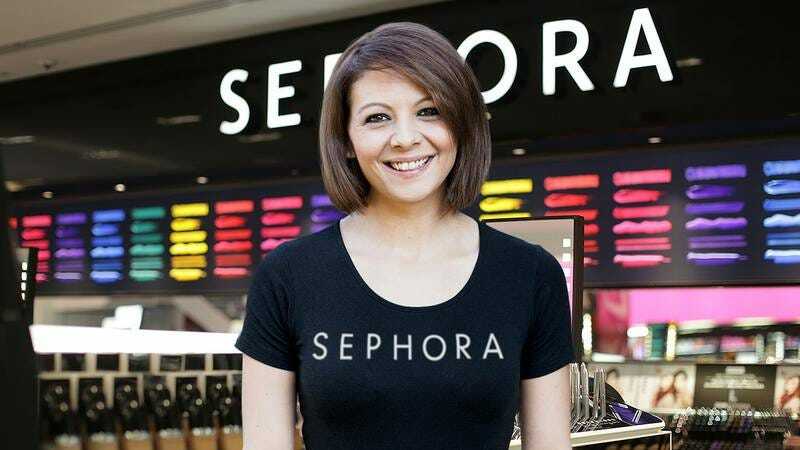 We love Sephora as much as anybody else, but here’s one person who seriously needs to take it down a notch: This woman has spent the last eight hours in a Sephora, wearing a Sephora shirt, and talking nonstop about Sephora products. Somebody has to get this woman an intervention, because this is just too much Sephora for one person. We’re not going to dock her for walking around a Sephora for an hour or two, because who hasn’t done that, but when you do it for eight hours straight, bother other customers with endless chatter, and then don’t buy a single thing at the end, it’s time to sound the alarm. It’s not healthy to spend that much of your time discussing the markdowns on top Marc Jacob fragrances—try talking about the weather for once! No one needs a new look that bad. Pace yourself! This girl is in serious need of a new hobby, because she can’t seem to stop hanging out at Sephora—apparently she left to have lunch yesterday, but then went right back afterwards! She was even spotted hanging around in the store after it closed, cleaning up. Honestly, no one should subject themselves to that much Sephora in one day. Also, for someone who is obviously obsessed with appearance, maybe don’t wear a Sephora T-shirt every single day. Seriously. It’s a little bit of tough love, but girl? This is starting to become a big problem. When you find yourself putting on a Sephora shirt then going up to everyone who enters a Sephora store and mentioning the names of all of the different products, and even the prices of some of them—that’s probably a sign you need to get out of there. Get yourself together!